One of the most central and also one of the most heated debates in critical discourses on African literatures in the second half of the twentieth century was concerned with the language issue, creating the impression that literature in African languages was a marginal phenomenon. This collection of essays is indicative of a new trend in the reception of African literatures, which strives to move creative writing in African languages – as an integral, exciting and mainstream part of African literatures more generally – into the centre of scholarly attention. 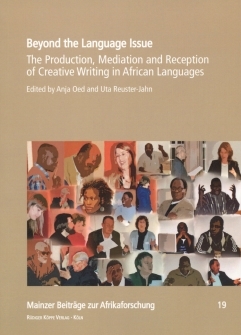 Exploring aspects of the production, mediation and reception of creative writing in African languages, the essays in this collection contribute to understanding the historical, social, cultural as well as personal conditions in which African-language literatures are written, published, read and negotiated. They discuss creative writing with different linguistic and literary backdrops and contexts – traditions of creative writing looking back on one or more centuries of literary production as well as traditions which are just beginning to assert, or reassert, themselves. The wide range of languages covered – including Chewa, Hausa, Igbo, Luba, Mbundu, Rwanda, Kongo, Lingala, Ganda, Shona, Sotho, Tswana, Sheng, Swahili, Xhosa and Yoruba – facilitates a comparative approach. The contributors to this volume, which is mostly based on papers read at the 8th International Janheinz Jahn Symposium, have diverse professional experience in the field of African literatures, for instance in publishing, translation, the ministries of culture and education of different African countries as well as in secondary and tertiary education, and several have themselves published creative works in African languages. Answers to ‘glocalisation’ in Swahili fiction – Chachage’s Makuadi wa Soko Huria and Wamitila’s Bina-Adamu! Anja Oed is a lecturer at the Department of Anthropology and African Studies, Gutenberg University of Mainz/Germany, and the Head of the Jahn Library for African Literatures. Her research interests include African literatures, Yorùbá literature and video film adaptations, African literary cityscapes, and literary representations of African civil wars. She obtained her PhD at the School of Oriental and African Studies, University of London. She holds an MA in English Literature and Linguistics, Musicology, and Anthropology from the University of Freiburg (Breisgau) as well as an African Studies Certificate from the University of Massachusetts at Amherst. Uta Reuster-Jahn, Dr. phil., is Lecturer of Swahili at the Asien-Afrika-Institut, University of Hamburg. She has published extensively on Tanzanian orature, popular Swahili literature and bongo flava music. The Symposium was able to acknowledge that the creative writing in African languages is by no means a marginal phenomenon. According to Anja Oed, the author of an introduction (pp. 9-32), it is time to recognise that the literature in African languages „[...] forms an integral, vital and exciting part of African literatures and, accordingly, deserves a much informed critical attention as literary texts written in English, French, or Portuguese“ (p. 11). In 1982, 40% of all literary titles in the Jahnhein [sic] Jahn Library were written in one of 31 African languages. In 2008, the Library was holding literary works in 69 African languages. [...] At the end of the book there are short notes on contributors. It is visible from them that the authors from Africa are very well represented: articles of seventeen Africans have been published in the book. Works cited by them enlarge our knowledge of trends in the literary study in Africa.